2013 Topps Garbage Pail Kids MiniKins are a combination of small figures and stickers. They are a throwback to a classic product, albeit one that's not as well known as the original cards. Long-time GPK fans are likely familiar with Garbage Pail Kids Cheap Toys. Released in 1986, they are small single-color plastic figures that are a lot like the popular M.U.S.C.L.E. toys from the same period. Garbage Pail Kids Cheap Toys continue to have a devoted following today and some can sell for high amounts. 2013 Topps Garbage Pail Kids MiniKins are like an updated spin on the Cheap Toys. Every pack has two mini figures and a pair of stickers. Base versions of the mini figures are now done in several colors. There are 26 different mini figures and stickers in all. There is also a chase element to 2013 Topps Garbage Pail Kids MiniKins. Variation figures come in neon colors, a nod to color variants from the original Cheap Toys. Neon Blue and Neon Red figures are each inserted 1:3 packs. Neon Green figures fall every fourth pack. Neon Yellow figures are the toughest, landing 1:12 packs. 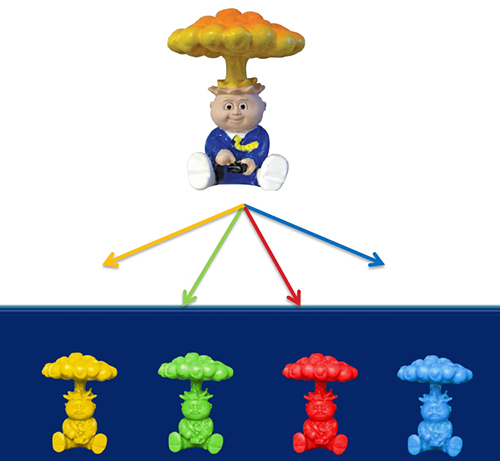 Factoring in all the different variations, there are 130 figures to collect in all. Besides basic packs, there are also 2013 Topps Garbage Pail Kids MiniKins jumbo packs. These have four figures, one of which is visible. Unlike the original Cheap Toys, MiniKins are not packaged with "Crummy Candy." 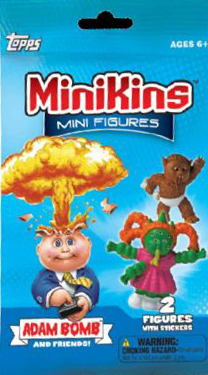 Thanks for the awesome write-up on the Garbage Pail Kids MiniKins figures. We are all stoked they are being released! Cheaptoyman � I am too. Just wish I could afford replacing the old Cheap Toys I had that made their way elsewhere. Ryan, I scored an almost full box of Crummy Toys from a roommate that worked in a convenience store warehouse. I’ve opened a few to see what they were (at the time I had no idea), but still have several still sealed “packs” if you’re interested.